"Audio Noir" on Mush Records Octavius has striven to perfect his amalgam of hip hop, electronic and avant rock music in the San Francisco underground over the past four years. 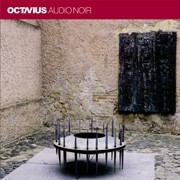 This new release looks to establish Octavius as a purveyor of even more elaborate territories of sound. Experimental freak-outs collide with classic song structures, tension and attitude give way to raw vulnerability, and octavius’ vocal and production techniques are employed to unnerving effect. 02. "Surprisingly Concerned With One Another"
07. "Sudden And Increasingly Strange Behavior"
08. "Artificial Sparks Of The Electrical Stripping"
09. "Before You Go Away"